I found this cabinet at the Goodwill for a great deal! At the time I didn't have any idea where I was going to use it but I figured if I couldn't find a spot for it I could sell it. I just loved the details on the doors. I thought they would look great with a nice glaze on them. I had some issues with the glaze, apparently you can't glaze over flat paint. So I ended up painting over it. I meant to take a picture of it, but trust me it was not good. I like how it turned out though, even without the glaze. It's hard to see the details from these small pictures but you can click on them to make them larger. I gave it a little distressing too for a little character. 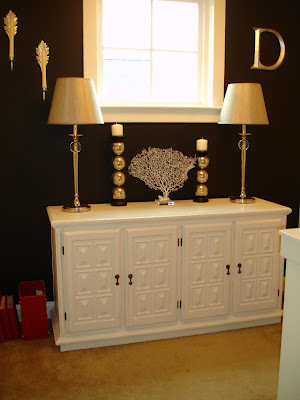 One of my favorite things about this piece is all the storage it provides. I used to have all my crafting supplies jumbled in the closet but now everything has a place in my new cabinet. These photo storage boxes are on sale at Michael's for $1 right now (reguarly $4.99) They weren't my first choice in color or pattern but for $1 I couldn't pass that up and you won't really ever see them anyway. I don't know about you but I couldn't be more happy that it's Friday! Have a great weekend! Absolutely love this piece!!! Good job and I like the way it pops against the wall. I love this! The distressing looks really nice. Everyone needs extra storage and this is just beautiful! wowzers. Next time you need to create, create one of these for me! TOTALLY impressed! I LOVE it! STOP IT! That's such a beautiful cabnetry! I wish my craft stuff had somewhere so pretty to hang out! Thanks so much for linking! 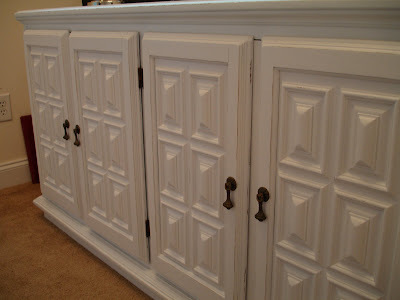 I LOVE LOVE refurbished things! 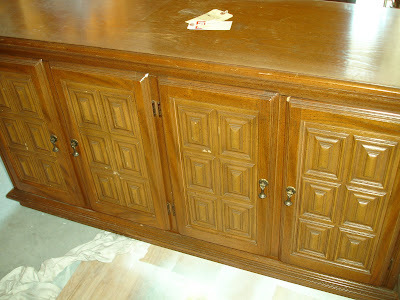 We have a cabinet similar to that, it was my husbands mothers. I would love to paint it, but he won't agree, he keeps saying he is going to work on it and stain it. Right now it is used for an entertainment center for the tv. 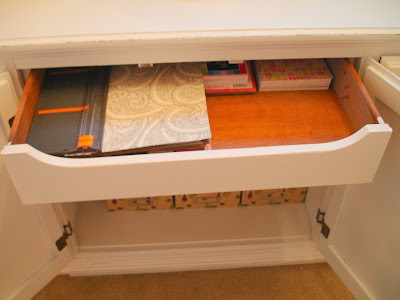 Oh, I love that little drawer. Paint makes such an amazing difference. 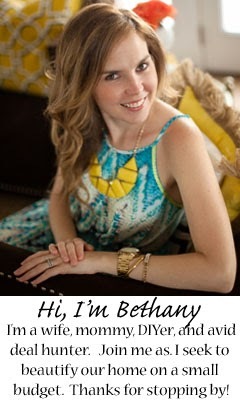 came across your blog and I am so glad that did! I love this piece! 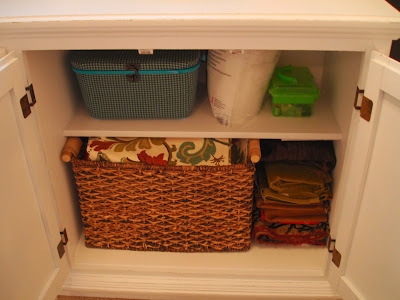 I wish that I could put all my craft stuff in a cute cabinet. Instead-it's oozing out the craft room. I know, I am pathetic! I have a question on your sewing table redo. What kind of paint did you use and did you sand and prime before-did you use some kind of a glaze? I have a table excatly like this sitting in my garage. If you have moment, please stop by and say hello! Thank you all so much! Tausha, for the sewing table I actually just sanded it a little, used the Kilz oil based spray primer, and then used white Rustoleum spraypaint. I contemplated putting a coat of poly on it but decided not to. I figured if it got a few more dings in it it would just add to the distressed look I was going for. Hope this helps! Fantastic transformation! I am including this in my InspireMy Saturday post today. Please feel free to drop by if you get a chance. oh my heavens, i WANT that!! i was totally going to recommend a glaze for the great details on the doors, but looks like you were a step ahead :) however, i had no idea that glaze and flat paint aren't capable of being friends, that's very good to know. I think I am in love. This turned out beautifully and look at all that storage! Amazing! 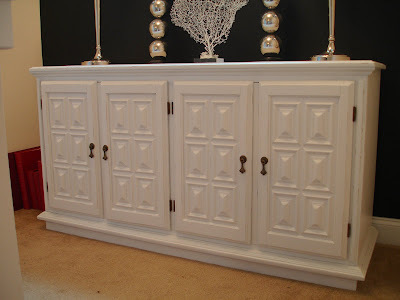 it looks so much better white, I really like this piece of furniture - lots of storage! You did a really great job. I love it. Lovely accessories too!! Very nice! I'm in creamy white love! I love your wall paint color too. Thanks for linking up to the Power of Paint Party (POPP). This inspired me! I'm going to find something great to paint. Way to go! 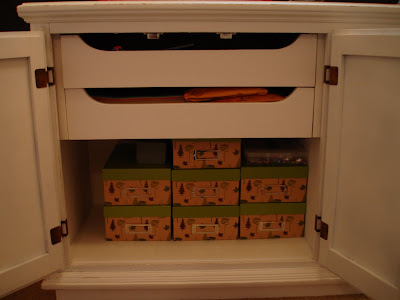 And those pull out drawers are a bonus!